MTB Coaching is Too Expensive! One of the biggest reasons why riders decline to take MTB coaching/instruction is the price… MTB coaching is too expensive! So, OK, I’ll readily admit that quality coaching isn’t cheap. I charge $500 for a two-day clinic. That is some serious scratch. But…what did your bike cost? Plus all your gear: riding get-ups, shoes, helmet, pack, rack on your car, couple pairs of cool shades… maybe your new set of carbon wheels… And, what’s your insurance deductable for an ER room visit? (And—trust me—there’s always something ridiculously expensive, that isn’t covered, in such visits). Also, how much money are you losing in missing work—disability insurance or not… What’s the cost of family members and significant others worrying about you both in getting injured and also every time you go out on the bike after you’ve been patched up and heal up? Have you ever taken a day of quality instruction in, say, golf or ski lessons? Scuba classes? Avalanche training? Or, how about a weekend seminar for work? What does something like that run? Hmmmm… five-hundo is almost looking cheap! I had another giggle moment at Palos yesterday. You probably rode “Badass Hill” while you were here. It’s a stretch of Bullfrog trail that is pretty long, pretty steep, somewhat rooty, and sweeps in a long turn. But mainly, it’s full of cobbles. Yesterday I was riding with a group of riders, all of whom are better than I am. Naturally they had pulled ahead. So, to try and keep up, I unwisely decided to bomb Badass. About halfway down I was on the far edge left as the trail was sweeping right when my brain realized that I was going MUCH too fast. But, on that surface, there was not much slowing down. And as soon as I looked at the trees just off my left elbow I started going toward them…. And then it all kicked in; I dropped heels, got low, looked at that sweet spot down the trail where I wanted to end up, dragged a bit of back brake and rode it out. My GPS said I was doing 19.3 mph; it would have been a very bad fall. And yeah, I was laughing like I did on Gravity Cavity. So I can truly say that the coaching, and practicing what I was taught, almost certainly kept me out of the hospital. The above email illustrates one very important reason why pretty much any rider that throws a leg over the bike should almost definitely take some quality MTB coaching/instruction: safety! But MTB coaching is too expensive! Proper technique—while it will make you much faster—isn’t necessarily about speed: it’s very much about just being safe! Is that worth $500? Do you owe that to yourself and others around you? Well, I have news for you: you’re riding at a beginner or novice level not because you lack the fitness or time on the bike, but, ultimately, because you’re doing a lot of things (most things) wrong when to comes to technique. If you were doing them right, you wouldn’t be riding at that level anymore. Unfortunately, when it comes to MTB’ing, bad technique doesn’t only mean going slow, it also means lack of control; lack of comfort and confidence; and finally, being unsafe…to yourself and others! YOU WILL get yourself into situations that you won’t be able to get yourself out of with poor technique. Almost all riders have pretty terrible technique by default. There are normal and common reasons for this. In the situation described in the above email, the rider would almost definitely have done almost everything differently had he not previously had quality MTB coaching: proper braking, proper trail-vision, proper body position and weight distribution…all of these things are very counterintuitive. And, it would take a lifetime of trial and error and learning-the-hard-way (and lots of hospital bills) before a rider would be able to react properly and make the proper decisions and adjustments in order to not end up seeing the inside of the ER room in that situation. The other really cool thing: the exact techniques that this rider used to preserve his hide, to not crash, to remain safe…are the exact things one would do if they were a serious racer, trying to go as fast as possible. Again, riding is simple once it is broken down to it’s very basics: whether you’re looking for more comfort and control on the bike, or you’re trying to shave seconds off your race time…the techniques are virtually the same. The difference is usually just a matter of more difficult terrain and higher consequences. What do you think the rider who wrote the email would say? Was it worth it? Sign up for a scheduled clinic or contact us about getting one in your area. Check our coaching philosophy and what to expect in DirtSmart camp/clinic. 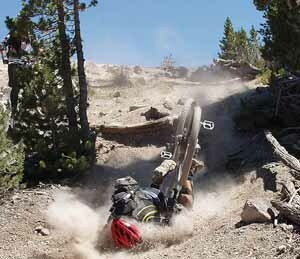 Do your riding buddies a favor and share this article with them before they learn the hard way! Andy is an amazing instructor. As a rider, I still use elements to this day that I learned from Andy about 5 years ago. As an instructor, I can attest to what Andy is talking about here, as I’ve had several students who became clients specifically because their spouses were concerned about the continued wrecks and the resulting hospital bills that were disrupting their families lives. Learn to ride safe! Also, MTB skills training is the only real investment that we can make as riders…gear gets worn out with time but solid foundational skills get better w/time and they are the one thing that makes every bike perform better, the one your riding now and the sweet set of wheels your saving up for.